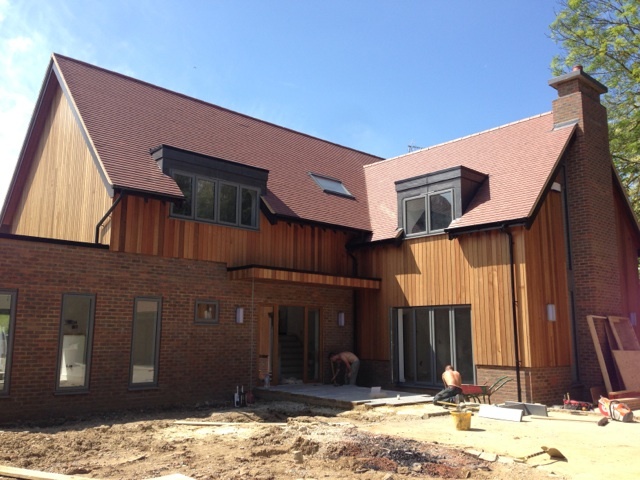 Cedar cladding is being used to great effect by Elysium Homes in Buckinghamshire in the construction of their new-build properties. The image shows how cladding can be used within a traditional design that compliments the tile roof, brick footings and powder coated window and door frames. The natural colours of the cedar, ranging from dark browns through to reddy hues, give the traditional design a contemporary feel. For more information on cedar, larch, thermowood or cumaru cladding, together with the protective treatments that are available call our sales team on 01472 350151.